We recently had a BBQ with my friend Misty and her family. 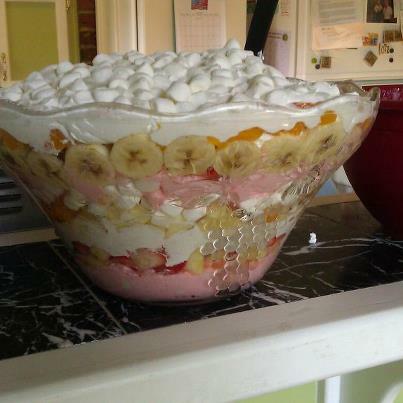 My kids requested she bring two things - Doritos & a fruit salad made with Cool Whip. And let me tell you, did she ever come through on both counts! The fruit salad was not only incredibly delish, but also gorgeous! Misty was kind enough to share the recipe for my blog. Thank you, Misty! And blogger friends, get ready for an amazing fruity sugar rush! Take the cream cheese out of fridge to soften. Once softened, put in mixer and mix on high. Add 2 Tbsp sugar and 2 tsp lemon juice and mix. Add 1 container of cool whip and mix well. Add strawberry banana jello mix and again, mix well. Fold in one package of mini marshmallows. Set aside in refrigerator. Open mandarin oranges and drain, then let set in drainer. Put a small amount of lemon juice in the bottom of two separate bowls. Slice the bananas and coat the slices in the lemon juice. This helps keep the bananas from turning brown. Core the apples and then slice into bite-sized chunks and place the chunks in the other bowl of lemon juice and coat well. If you don't want the apple peel you can remove the skin before you core the apples. Chunk the strawberries and set them aside. In a large glass bowl begin layering. The first layer will e the mixture from the fridge of cool whip, jello mix, cream cheese and marshmallows. Next make a strawberry and banana layer. Next, a layer of cool whip. Then a small layer of marshmallows. Then add a layer of apples and oranges. Continue with the layering until you have used all of your ingredients. On the top use the rest of the cool whip then cover with the rest of your marshmallows. I did this so that when I covered it, the cool whip wouldn't stick and make a mess when uncovered. Wow Danyelle! I just gained 10 pounds by reading your blog. Holy cow that sounds rich (but delicious). Thanks for sharing. I guess I know what I'm bringing to our next ward dinner!! Looks yummy!! Thanks for posting the recipe. I need to make this. Now. It's Great to Be Almost Eight!